along with large amounts of fluids (called “irrigation therapy”) for urinary tract infections (UTI), urinary tract inflammation, and kidney stones (nephrolithiasis). internal bleeding, including uterine bleeding, nosebleeds, and bowel bleeding. anemia, poor circulation, an enlarged spleen, diabetes and other endocrine disorders, stomach acid, diarrhea and dysentery, asthma, lung congestion, rash and eczema, cancer, preventing the signs of aging, “blood purification,” wound healing, and as a general tonic. applied to the skin for muscle aches and pains, oily scalp, oily hair, and hair loss (alopecia). 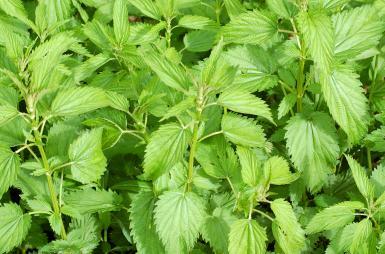 Nettles can also be taken as a ‘medicinal’ in a tincture/extract form. One dropper full a day will help relieve allergy symptoms, and will help with many of the above mentioned health conditions. Nettles (which contain tannic acid, lecithin, chlorophyll, iron, silicic acid, lime, potassium, phosphorus, sulfur, sodium, chlorine, and vitamins A and C) are most popular as a nutritious potherb. Using a glove and knife, gather the young, tender plants in April or May when they’re about six inches tall. Wash them in running water, place them, still dripping, in a saucepan and steam the greens, covered, for about 20 minutes. Then chop and serve the vegetable with salt, pepper, and butter. You can also add nettle greens to soup, make a Scottish “nettle pudding” with leeks, broccoli, and rice or brew up a delicious herbal drink similar to ginger beer. Furthermore, fresh leaves, when boiled in well-salted water for ten minutes, can be used (like rennet) to curdle milk for cheesemaking. When dried, the plant is 40 percent protein, rivaling cottonseed meal as a source of the vital nutrient. Nettle fodder is said to make cows give more milk, and — if powdered and added to their feed — induce chickens to lay more eggs. Also, since the herb contains 7 percent nitrogen (dry weight), it makes an excellent garden mulch or fertilizer. The genus name for stinging nettles, Urtica, comes from the Latin root that means “burn” — a reference to the burning skin irritation caused upon contact with the plants. Of stinging nettles’ capacity to cause skin irritation, the Ohio Perennial and Biennial Weed Guide remarks, “Toxins thought to be involved include formic acid (also found in ants), histamine, acetylcholine and 5-hydroxytryptamine.” Jewelweed can be used as a home remedy to counteract their toxicity. The symptoms resulting from an encounter with stinging nettles is mainly a burning sensation just after contact, followed by an itchy rash. Urtica dioica is a broadleaf, perennial plant. Depending on your perspective, you could also categorize it as either a noxious weed or an herb with culinary and medicinal uses. It also often grows in masses, forming a monoculture. If you see a group of such plants (see photo above), look for those noxious bristly hairs along the stems of the plants and on the undersides of their leaves. The plants spread via rhizomes. Don’t confuse these plants with dead nettle (deadnettle), a harmless perennial plant used in shade gardens.